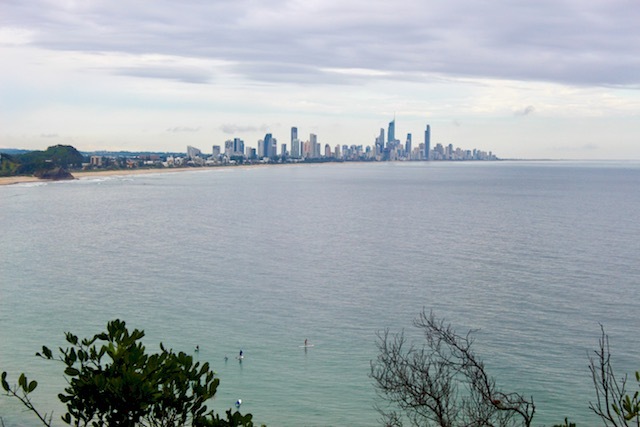 Burleigh Heads National Park offers the best of the best: perfect views of the Gold Coast City skyline, access to remote beaches and creeks, native rainforest and a number of unique viewpoints. Burleigh Heads National Park is my 1 hiking trail on the Gold Coast as it exposes you to so many different elements of the Gold Coast. This article will tell you everything you need to know about hiking in Burleigh Heads National Park. 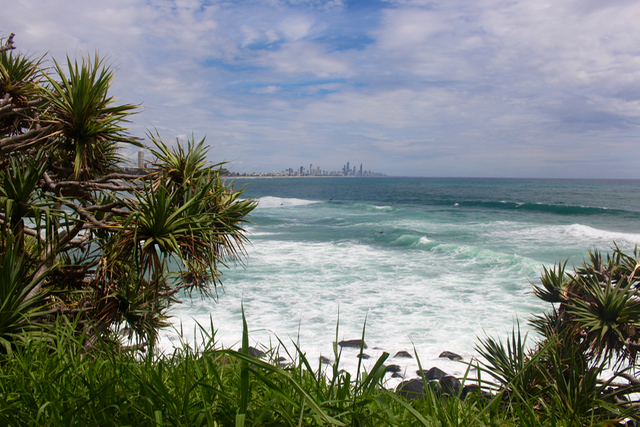 Within Burleigh Heads National Park, you have several options of hiking trails. I have attached a National Park Map below. The oceanview track is best suited for families. This track is relatively flat, starting out at Burleigh headland and following the base of the headland around the Talledudgera Creek. Jebbribillium lookout is found shortly into the hike, as you enter from Burleigh headland and head upwards. This is a great spot to stop for a quick north facing photo. Tumgun lookout is the highest point in Burleigh Heads National Park, overlooking Tallebudgera Creek and the Southern end of the Gold Coast. Tallebudgera Creek is one of the nicest waterways on the Gold Coast. Everyone should add Tallebudgera Creek to their Burleigh itinerary. My preferred trail enters the park from Burleigh Headland (Northern entrance) and goes up the hill, past Jebbribillium Lookout (2) and up to Tumgun lookout (3). From Tumgum Lookout I suggest continuing along the trail which will lead you down to Echo Beach and Tallebudgera Creek (5). From Tallebudgera Creek you can continue along the loop called the Ocean view Track (1) that will lead you back to where you started at Burleigh Hill. This trail is a loop and passes all the best parts of the National Park. This loop will take you 45 minutes to 1.5 hours, depending on how fast you hike. I suggest leaving more time for yourself and making a day out of it. Burleigh Heads National Park is one of the nicest places on the Gold Coast so pack a picnic, some swimmers and a towel and enjoy some time at Tallebudgera Creek or on Burleigh Headland, after your hike. For a day at Burleigh Heads National Park, I suggest packing swimmers, a towel, sunscreen, water bottle, snacks, camera and a go pro. You can also pack a picnic or BBQ if you plan on staying for the whole day. Burleigh Heads National Park is located in the heart of the Gold Coast. 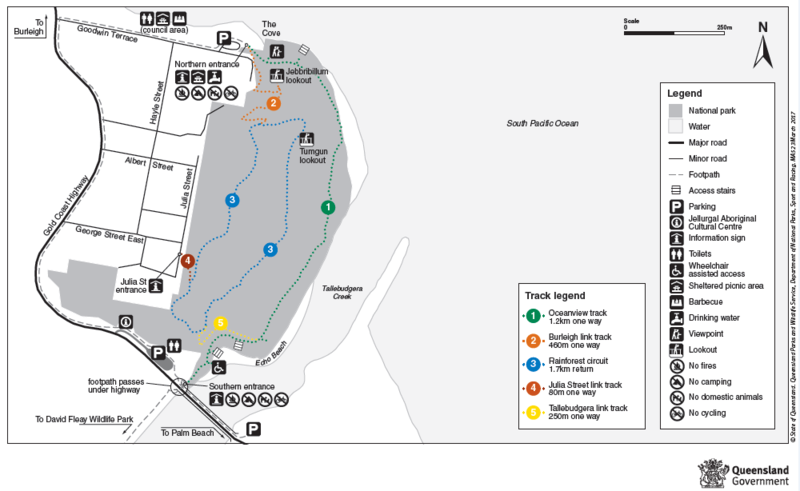 I suggest parking at Burleigh point and entering the park from the Northern Entrance. Please note, parking at Burleigh Heads National Park can be busy, so try and arrive early, or prepare to be patient. You won’t find any facilities within the park itself, but you will find everything you need (bathrooms, water, cafes) at Burleigh Headland, my suggested starting point. 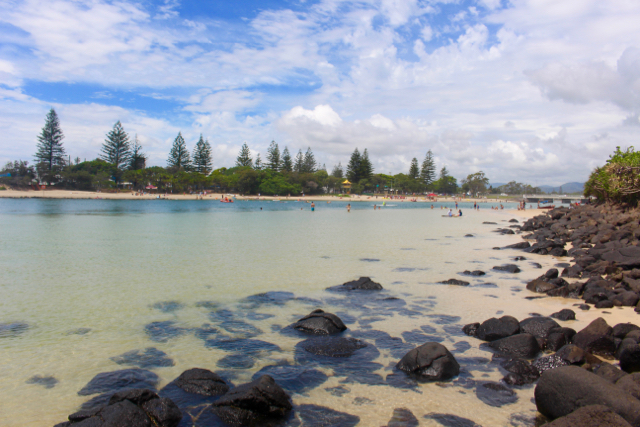 Plan ahead and come prepared to spend a few hours down at Echo Beach and Tallebudgera Creek. Tallebudgera Creek is one of the nicest waterways on the Gold Coast. Watch out for snakes, I don’t want to scare you but it is good to keep an eye out. Wear a hat and sunscreen – the Gold Coast sun is hot. If you take any rubbish into Burleigh Heads National Park, make sure you take it home with you. Don’t forget to pack a big water bottle. You can refil your water bottle at Burleigh Headland.